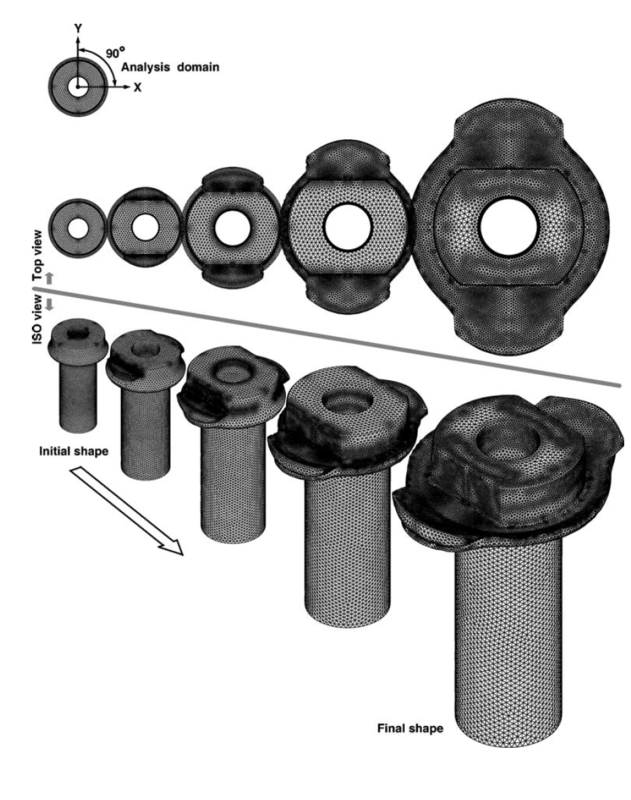 A five-stage cold-forging sequence is selected as a representative example of multistage automatic forging processes because it has four axisymmetric forging stages followed by a non-axisymmetric forging stage and involves piercing and heading processes accompanying folding and overlapping. The importance of using a combined 2D and 3D simulation is illustrated in this blog article in terms of the solution precision and accuracy, and computational efficiency. Quadrilateral elements for 2D approaches (first four axisymmetric stages) and tetrahedral MINI-elements for 3D approach (final stage, non-axisymmetric) were employed. The workpiece was pierced during the fourth stage and headed during the final stage. The workpiece flash had overlapped during heading process and this was removed by an additional trimming process which was not included in this part of the study. The axisymmetric simulations were carried out with AFDEX 2D for the first 4 stages. For the final stage, one fourth of the geometry was selected employing two planes of symmetry and then simulated using AFDEX 3D. The number of tetrahedral elements were around 80,000 and the friction factor was 0.1 with an upper die velocity of -1 mm/s. The 2D geometry from the fourth stage was rotated to generate the hexahedral elements as shown in Figure 2. The state variables of the hexahedral elements were calculated, and the hexahedral mesh was then automatically remeshed into a tetrahedral mesh system which acted as an input to the final and fifth stage of the process. The simulation was continued by using AFDEX 3D. The result animations are presented above and illustrate the excellent quality of mesh as well as the overlapped flash. 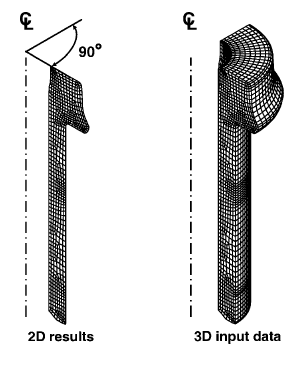 The simulated results were excellent from the viewpoint of mesh quality since intelligent mesh generation techniques were employed. The combined 2D and 3D simulation technique coupled with the intelligent tetrahedral mesh generation provided a precise and accurate simulation of the multistage automatic cold-forging process.